The Frenchman is gone on a two-week business trip, and I am restless. I walk to the market, to get out of the house, to take a break from writing. On a whim, I buy two punnets of raspberries, right out of the gate. 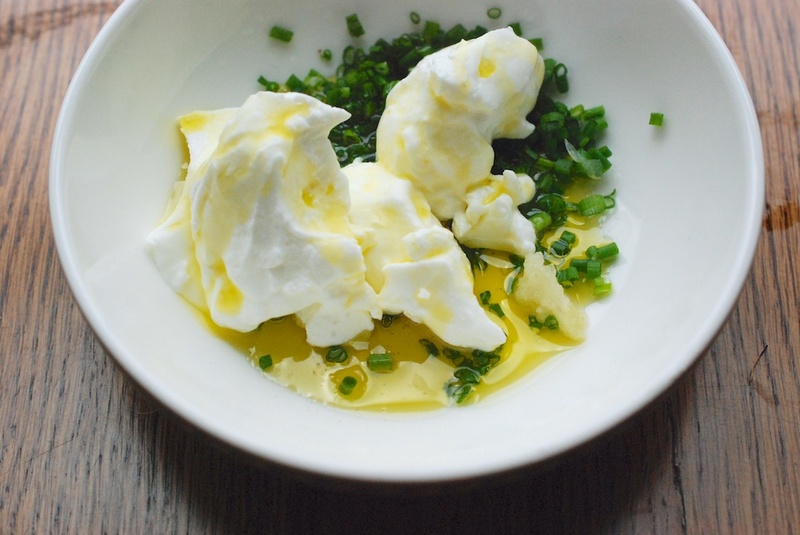 Consider folding them into cold cream. There are egg whites in the fridge which, stiffened with almond extract, makes a raspberry version of Eton Mess. Or, simmer the raspberries with honey until they collapse, swooning, into a syrupy jam. You could thin the cream with milk and make a posset. If you are charmed by old world, summer desserts, try a fool, a cranachan, a syllabub. The solid presence of peaches, pyramided onto wooden pallets, heaped onto every farmer’s table, can be a comfort. Lately I’ve developed an inexhaustible lust for doughnut peaches; three bites puts them away. Their muted sweetness seems to temper the acidity I normally associate with peaches. Doughnut peaches are peach’s calmer cousin; even the flesh is dewy rose, against the standard peach’s brazen sherbert. Of course there are tomatoes too, misshapen and substantial. 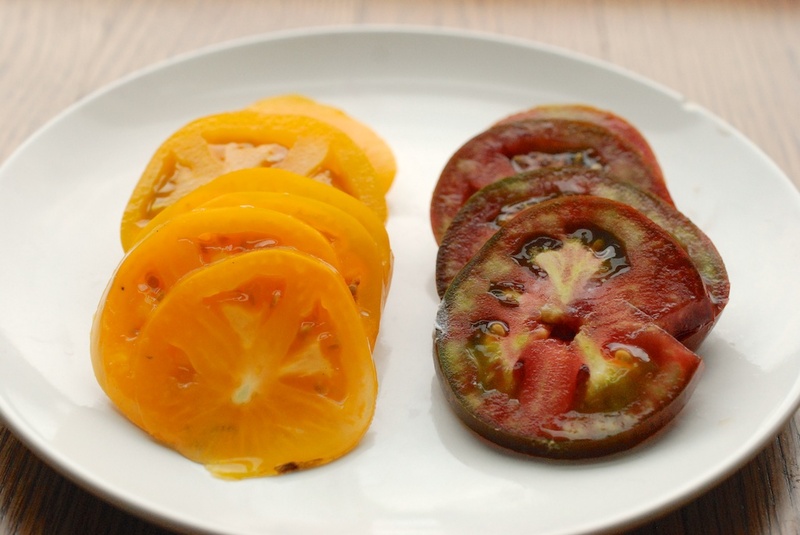 My favorite are the miniature, garish Sun Golds, which open tart and warm in the mouth. Today, I select a Snow White Cherry and a Brandywine Yellow to take home. They, like the peaches, like the blackberries and the cantaloupe’s hidden center, are outrageously colored. 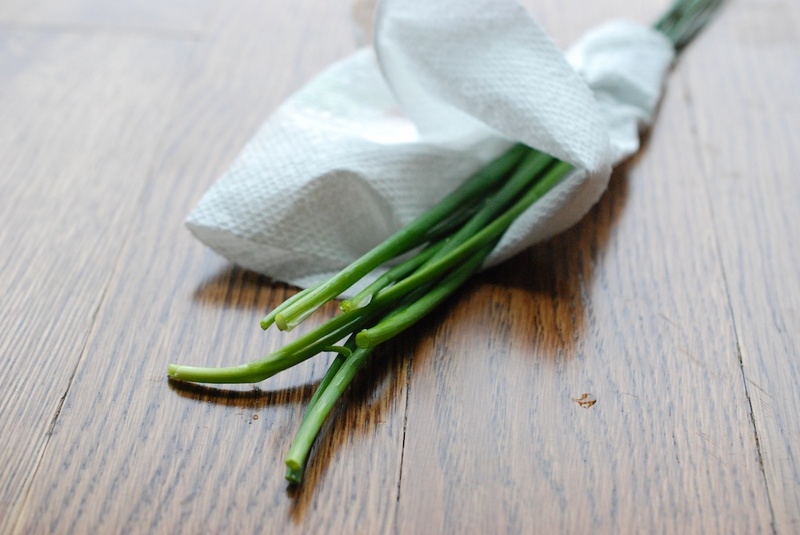 To finish the shopping, I reach for a cob of corn, a tiny serrano pepper, and a fan of chives. 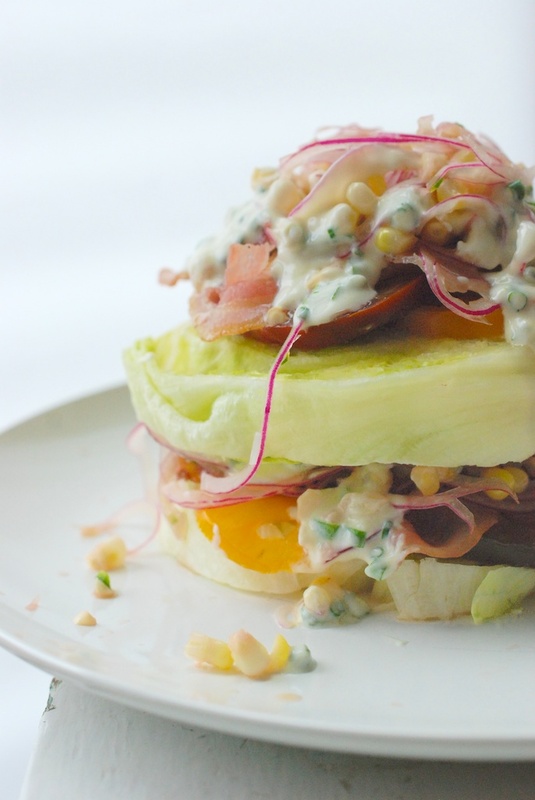 When I get home, I mix a zingy yogurt dressing and cut a head of iceberg lettuce into slices. 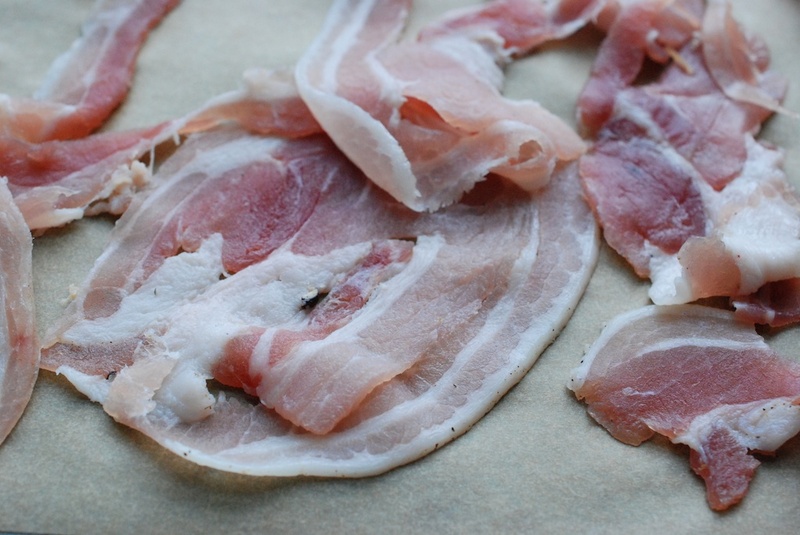 I move pancetta rounds into the oven and wait for them to crisp. The whole thing comes together in a flurry of Parmesan cheese. Ah, lunch. 1. Set a pot of water to boil; the base of the pot should be wide enough the accommodate the length of the corn. While the water is heating, shuck the corn. When the water starts to simmer, add the corn; cook for just a few minutes, until the kernels turn brighter. Reserve the corn water. Wait for the corn to cool slightly, and then cut the kernels from the cob. 2. 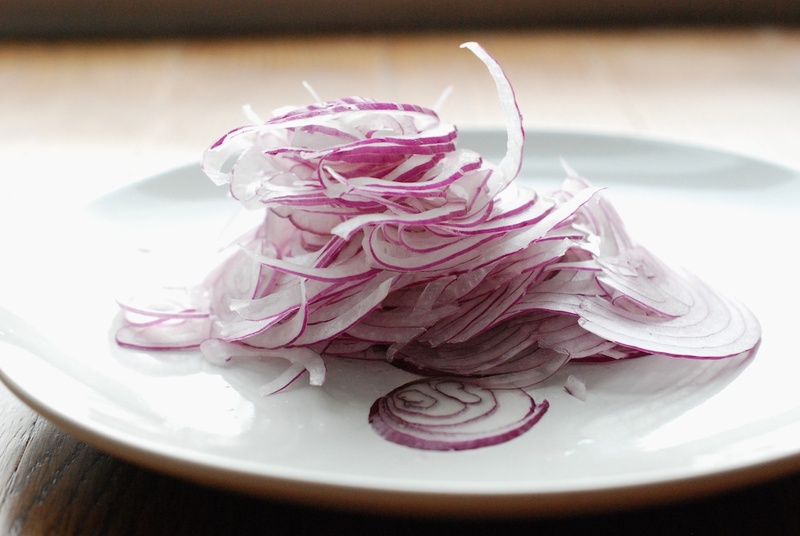 Slice the red onion, crosswise, as thinly as possible. De-seed the serrano pepper half, and dice it, as finely as possible. 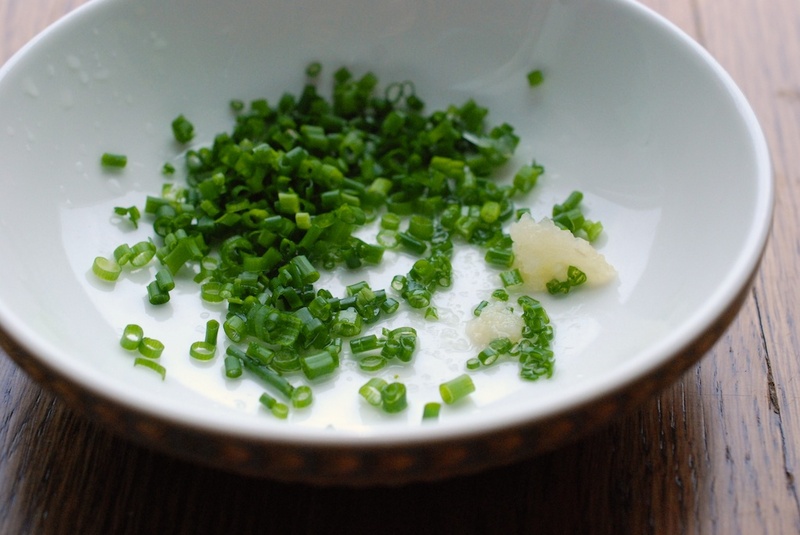 Move the onion and serrano to a medium-sized bowl, and spoon on the red wine vinegar. Toss, until the onion and serrano are evenly coated with the vinegar. Set the bowl aside. 5. Slice the tomatoes. 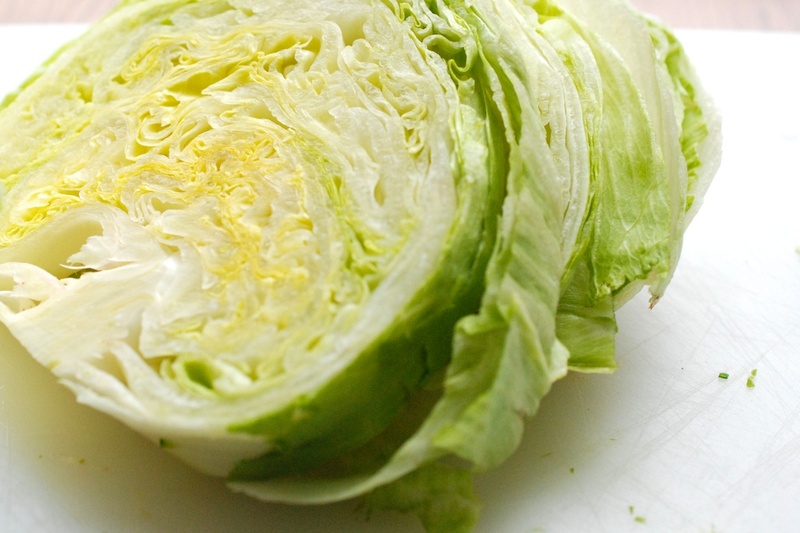 Slice the iceburg lettuce, crosswise, into 1″ rings. 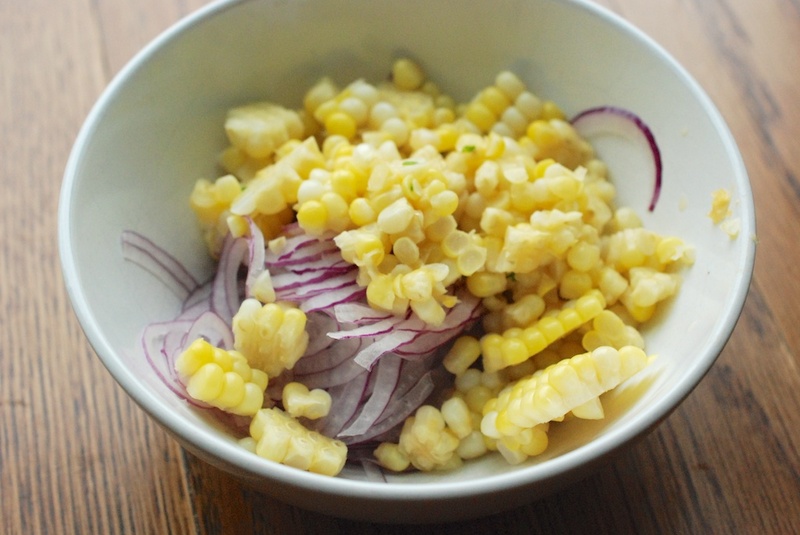 At the last minute, toss the corn kernels in with the red onion and serrano pepper. 6. 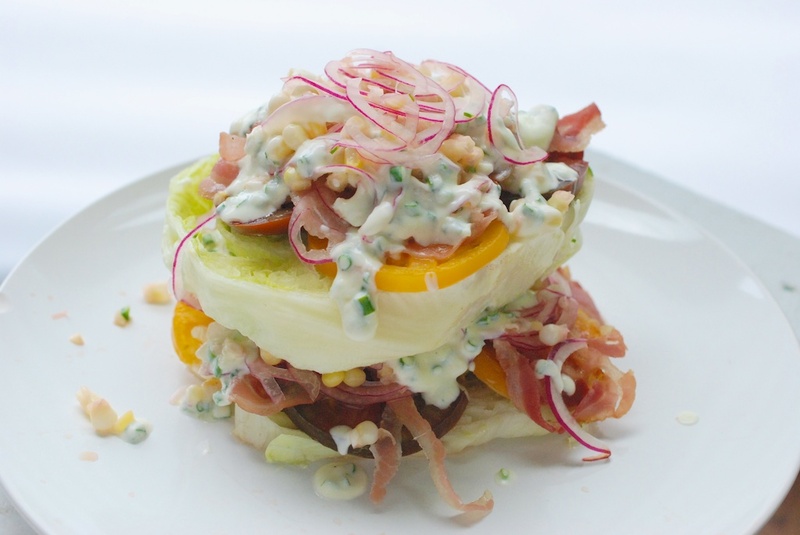 Assemble the salad: Lay an iceberg lettuce ring on each plate. 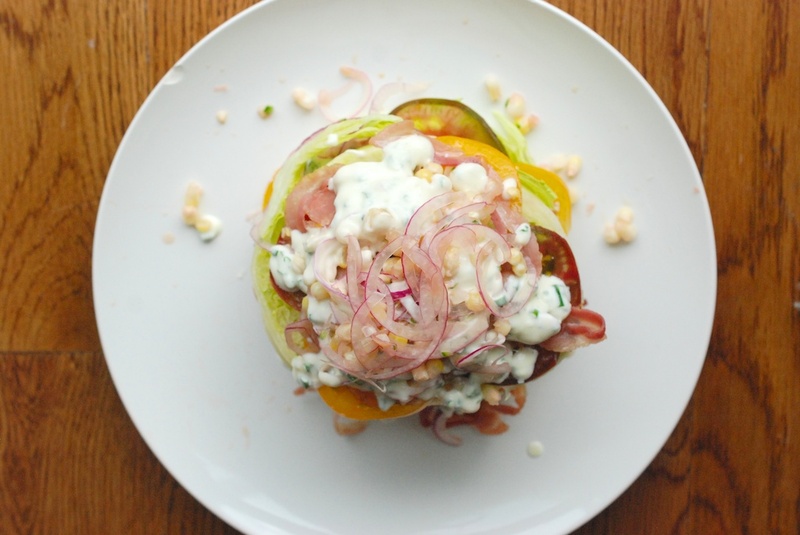 Next, a single layer of tomatoes, then the pancetta, a spoonful of the onion/serrano/corn, and a spoonful of the yogurt dressing. 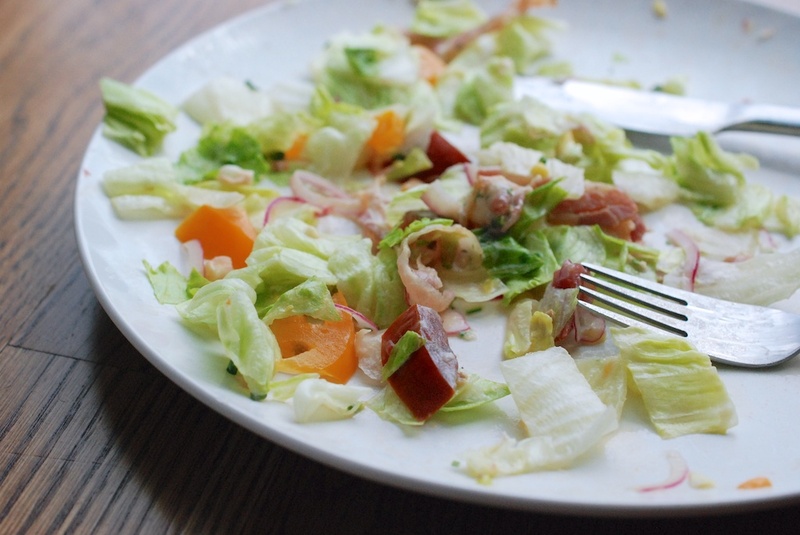 Repeat this once more, so that you have two layers of each component on each plate. Finish with a sprinkling of Parmesan cheese, if you like.